The kids' Halloween party food ideas offered below can each be made using either homemade or store-bought cookies! It's the finishing touches that make these fun foods for Halloween! 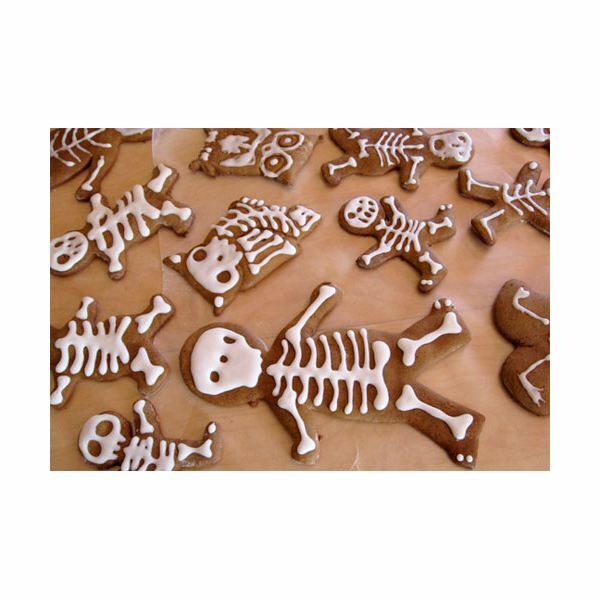 The first idea for kids' Halloween party food uses basic gingerbread cutters to create something a little more haunting – a skeleton figure made of chewy chocolate gingerbread! To Make the Cookies: Chop the chocolate into chunks. Sift together flour, ground ginger, cinnamon, cloves, nutmeg and cocoa. Beat the butter and ginger for four minutes. Add brown sugar and molasses. Then, dissolve baking soda in the boiling water. Beat half of the flour mix into the butter mix. Bear in baking soda mix, and then the remaining half of the flour mix. Mix in the chocolate and turn out the dough onto a piece of plastic wrap. Pat the dough out and seal with the plastic wrap. Refrigerate until firm. When you are ready to begin baking, heat the oven to 325 degrees. Roll the dough out and use basic gingerbread man cookie cutters to cut out shapes. Bake for 13 to 15 minutes, or until lightly browned around the edges. Cool before decorating. To Decorate: Using the white decorator frosting, first create a skull at the head of the gingerbread man. Next, pipe a spine extending down from the skull. Add "bones" extending out to the limbs from the spine. You can also add ribs, if you like. *** Short on time? Try using a pre-made gingerbread dough, instead. Pillsbury makes one! This is probably one of the easiest ideas for kids' Halloween party food! For school, you many want to make several cookies and then cut them into squares or slices. The base of this is a large, store-bought cookie cake. If you are not inclined to purchase one, you could always make your own using a pizza pan and a basic chocolate chip cookie dough recipe, which is then baked according to the recipe's directions. For decorating, you will need an extremely wide decorator tip and pastry bag. Your local craft supply store or cookware shop should be able to provide assistance. 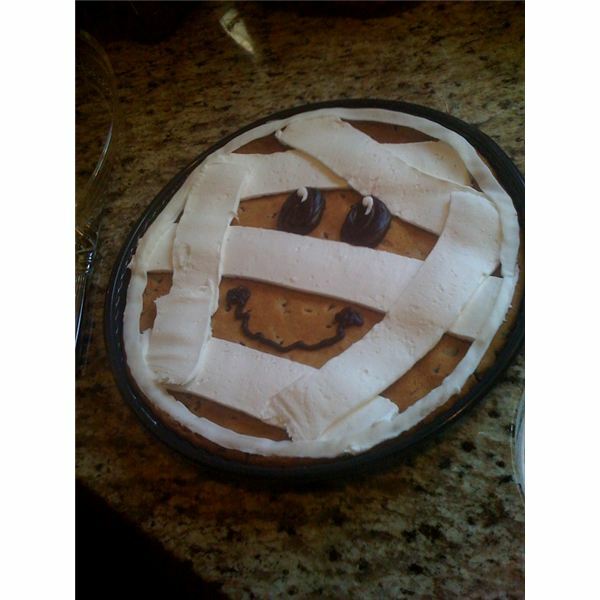 Simply use white decorator frosting to "wrap" your mummy face, and then use black decorator frosting to add two eyes and mouth. Additional white frosting dollops may be used for the eyeballs. Or, if you prefer, you can use white frosting to make the eyes, and then add two malted milk balls for the eyeballs. Want to get really creative? Use red decorator frosting to create blood-shot eyeballs! Even more fun foods for Halloween parties may be found right here at Bright Hub, along with fun party games for kids.